Rabbinic seminary established in New York city under the auspices of the Jewish Theological Seminary Association; founded in 1886 mainly by the exertions of Dr. Sabato Morais of Philadelphia, and conducted by him till his death, he serving as president of its faculty, and the Hon. Joseph Blumenthal being president of its board of trustees. Dr. A. Kohut was its professor of Talmud, and it issued seven reports containing scholarly papers. 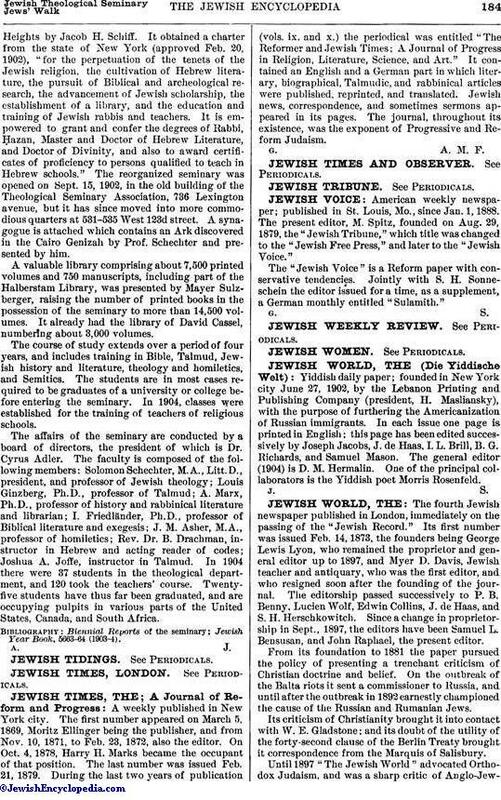 The position of the association having become precarious after their death, a new organization was projected in Oct., 1901, entitled "Jewish Theological Seminary of America," with which the association was invited to incorporate. This arrangement was carried into effect April 14, 1902. The new organization was endowed with a fund of over $500,000, and was presented with a suitable building on UniversityHeights by Jacob H. Schiff. 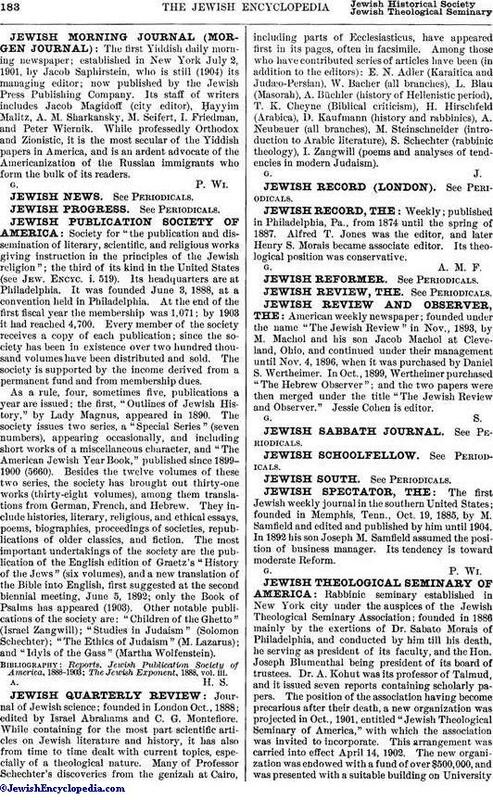 It obtained a charter from the state of New York (approved Feb. 20, 1902), "for the perpetuation of the tenets of the Jewish religion, the cultivation of Hebrew literature, the pursuit of Biblical and archeological research, the advancement of Jewish scholarship, the establishment of a library, and the education and training of Jewish rabbis and teachers. It is empowered to grant and confer the degrees of Rabbi, Ḥazan, Master and Doctor of Hebrew Literature, and Doctor of Divinity, and also to award certificates of proficiency to persons qualified to teach in Hebrew schools." The reorganized seminary was opened on Sept. 15, 1902, in the old building of the Theological Seminary Association, 736 Lexington avenue, but it has since moved into more commodious quarters at 531-535 West 123d street. A synagogue is attached which contains an Ark discovered in the Cairo Genizah by Prof. Schechter and presented by him. A valuable library comprising about 7,500 printed volumes and 750 manuscripts, including part of the Halberstam Library, was presented by Mayer Sulzberger, raising the number of printed books in the possession of the seminary to more than 14,500 volumes. It already had the library of David Cassel, numbering about 3,000 volumes. The course of study extends over a period of four years, and includes training in Bible, Talmud, Jewish history and literature, theology and homiletics, and Semitics. The students are in most cases required to be graduates of a university or college before entering the seminary. In 1904, classes were established for the training of teachers of religious schools. The affairs of the seminary are conducted by a board of directors, the president of which is Dr. Cyrus Adler. The faculty is composed of the following members: Solomon Schechter, M.A., Litt. D., president, and professor of Jewish theology; Louis Ginzberg, Ph.D., professor of Talmud; A. Marx, Ph.D., professor of history and rabbinical literature and librarian; I. Friedländer, Ph.D., professor of Biblical literature and exegesis; J. M. Asher, M.A., professor of homiletics; Rev. Dr. B. Drachman, instructor in Hebrew and acting reader of codes; Joshua A. Joffe, instructor in Talmud. In 1904 there were 37 students in the theological department, and 120 took the teachers' course. Twenty-five students have thus far been graduated, and are occupying pulpits in various parts of the United States, Canada, and South Africa. Jewish Year Book, 5663-64 (1903-4).